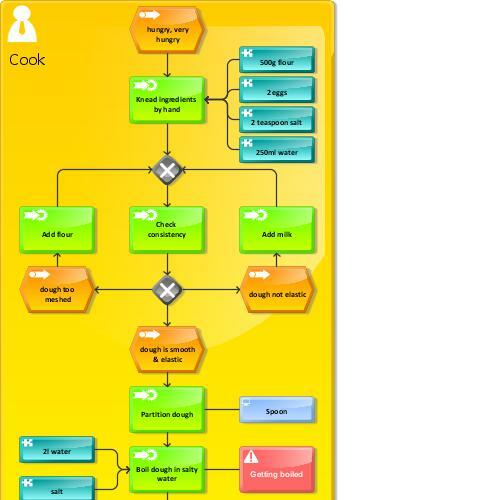 In my last post, I showed to you a simple process modeling example based on the “Schwenker” menu from Saarland. The process used was just a step-by-step instruction. Today, I show you a little bit more complicated process in order to prepare “Mehlknepp”. Have you ever been in Saarland for a culinary journey? Saarland has four „Michelin-Star houses”. Two of them are the Victor`s gourmet restaurant Schlossberg in Perl- Nennig of Christian Bau and the guest house in Saarbrücken of Klaus Erfort. They achieved the best evaluation with 3 stars. Those restaurants belong to the nine best restaurants of Germany. Compared to my previous process model, this one is a little bit more complex. It includes a loop to ensure the Mehlknepp have the correct consistency before they get boiled. If they don’t have the correct consistency yet, you need to add milk or flour. There are different possibilities to experience the “Mehlknepp”. You can take them as starter with salad or as main dish for example as “Geheirade” (another Saarland menu but you have to mix them with fried potatoes) or as dessert with apple sauce. Serve them with sauce or escallop them! “Mehlknepp” are easy to cook and easy to variegate! So long, have fun cooking “Mehlknepp”. Whenever I stop by on Mauritius island, please cook this saarlandian recipe! Saarlandians tend to get homesick very quickly. And I bet it's also true for Mauritians that you can't find a place where you don't run into another Mauratian. That happens to Saarlandians all the time all over the world. Believe it or not, Saarlandians and Mauritians have common ancestors! Yes, we do! And Shameem, you know that for sure, from his name your island's state name Mauritius had been derived. On this small planet we are all relatives, aren't we!? Why don't we take care of each other just like one big family "Earth"!? Absolutely right, we are somehow related:). I will be very happy if you visit us here in Mauritius and no doubt I shall be more than pleased to show you around. Talking about the House of Nassau, we have a very famous hotel here in Mauritius called 'Prince Maurice de Nassau', named after the Prince Maurice of Nassau. Believe me it's a really really lovely hotel. I remember for the grand opening someone from the Royal family came for the inauguration. I think it's a grand grand son:). I would like to seize this opportunity to thank you for the nice posts you have been writing for the community. In EPC, a function/activity cannot trigger another function/activity. It should only lead to events. So partition dough should lead to Dough Partitioned event and that event in turn should trigger funtion Boil dough in salty water. The change of function/activity and event is an important element of the process description. Indeed this process description include redundant information at some points. Therefore it exsists a convention that these so-called trivial events could be left out. In the example above the event you have proposed "Dough Partitioned event " is a so-called trivial event. Can a function produce function itself? What i previously believe every function starts with an event and ends with an event.I am refrering the digram above Knead ingrediants by hand and partition dough are two functions producing function only.Forgive my mistke if i am wrong i am a new to business process design. you are right, normally a function should produce an event which again can trigger a function. However, often those events contain no additional meaning and are removed from the diagrams to save space. I think nowadays it is good modelling practice to leave them out in case they don't deliver any additional meaning. Search ARIS Community for "trivial event" and you might find similar discussions. Be careful if you miss out trivial events - you need to be sure they really are trivial. For instance I have seen many processes where people have modelled a step called "check something" and then immediately followed it by another task. The question I ask is what are you checking and why? Surely there is more than one outcome? I always recommend putting all the events in to start . Don't just blindly use the name of the previous task with verb and noun swapped, but think about what the real ouctome of the task is. That way you will design effective processes that don't just take the "happy path". You can delete the really trivial ones later once you are sure your process flow is correct or you can automatically hide them in ARIS Business Publisher. this is the different process and yet different ingediants are add to this to made a good one. In this process you get m any assesments with this and upgrade the model the recipe is not dificult but you have to get this in a standard style. refers to you a better question options.